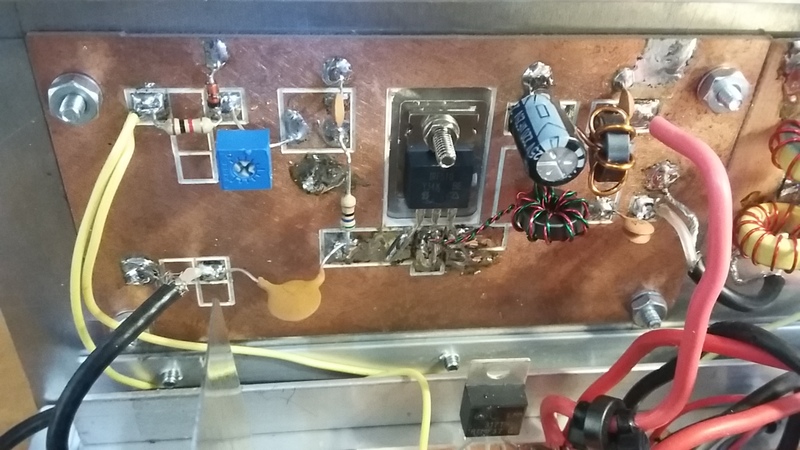 The Final Amplifier uses the IRF510 Power MOSFET which was pressed into service when I made a U Turn in reserving the K5BCQ 5 Watt RF Brick for use on another project. It is not my favorite RF device but was handy and cheap, like less than $1. It works in this application so it was used. The circuit for the IRF510 has been used by many others and is not original with me. The only original part is that I have designed a PCB Board that is "universal" in that it will work with various output devices including real RF devices that have either the Collector as the Tab or the Emitter as the Tab. Below is the circuit schematic and noteworthy is that my board has a cut out area so that the RF device can be mated to a heat sink. In this build the board is mounted to the back panel where we have about 40 square inches of 1/16 aluminum plate for the heat sink. It doesn't even get warm. For thos new to homebrewing you do need a insulation kit to install the IRF510 directly to the heatsink. Don't omit this TO-220 insulation kit!!!!! If you do fail to install the insulation kit, you will smoke the IRF510! 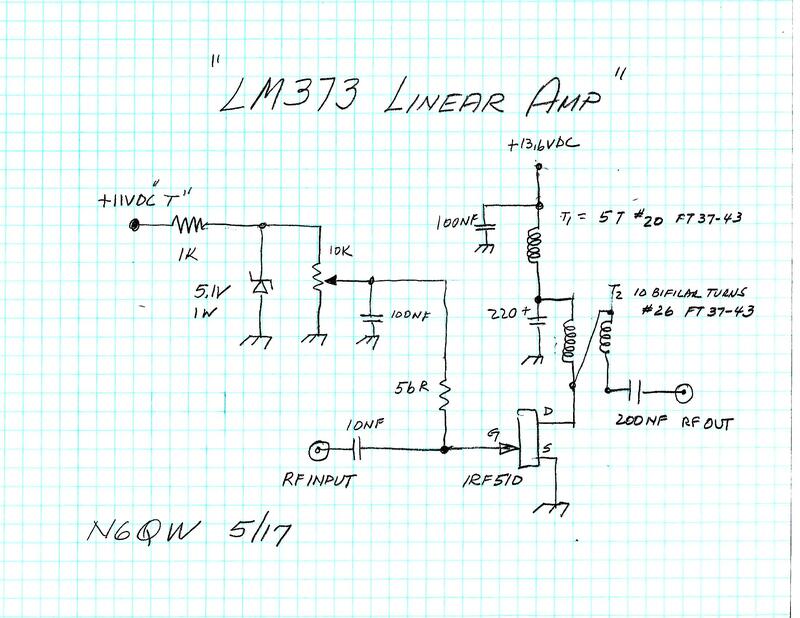 Adjustment of this amp involves setting the bias so that the amp operates in a linear manner. I typically listen to the rig on an external receiver with no modualtion and adjust the bias until you just begin to pick up the background noise. This typically is around 4 volts of bias on the Gate. But this may vary with the actual IRF510 and who made it. The Chinese knockoffs tend to lack uniformity in the devices. The listening tests I find to be the easiest way to adjust for linearity. When you hear it --you know you are in the linear range.